Hourly to full day canoe and kayak hire leaving from and returning to the Hire Centre on the banks of the River Stour with hire prices from £10 per person for the first hour and £4 for each 30 mins thereafter. 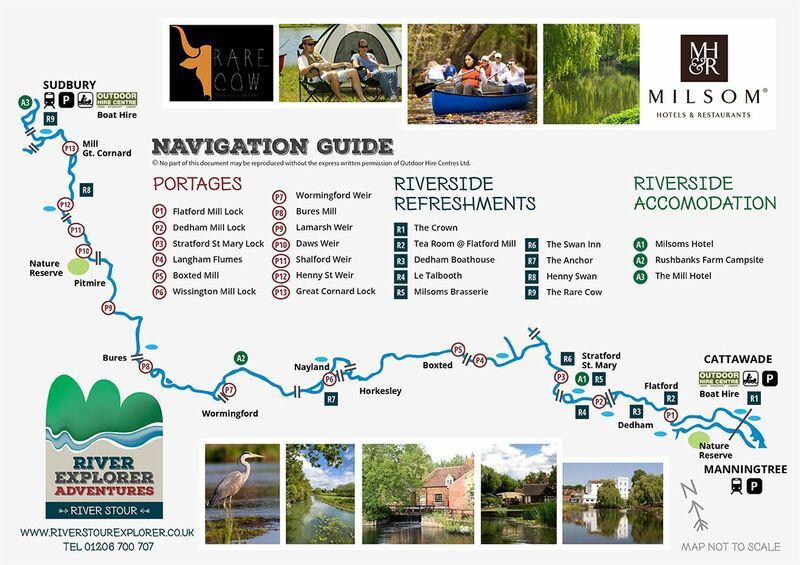 One Day Challenge Paddles, beginning from the Sudbury Hire Centre paddling the full 24 mile navigable length of the river to Cattawade using our kayaks. £65pp incl return transfers. Two Day Canoe Camping Trips, using either canoes or kayaks. Taking a leisurely (family friendly) pace along the full length of the navigation staying overnight at a secluded riverside campsite. Prices from £110pp with your own camping kit or £140pp with our camping kit. Prices incl boats, camp site fees and transfers. Camping Kits, optional for Canoe Camping customers.